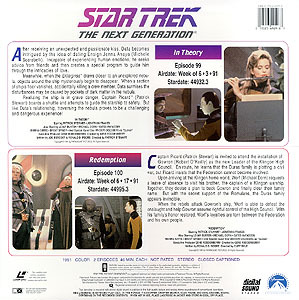 After receiving an unexpected and passionate kiss, Data becomes intrigued by the idea of dating Ensign Jenna Anaya (Michele Scarabelli). Incapable of experiencing human emotions, he seeks advise from friends and then creates a special program to guide him through the intricacies of life. Meanwhile, when the Enterprise draws closer to an unexploded nebula, objects around the ship mysteriously begin to disappear. When a section of the ship's floor vanishes, accidentally killing a crew member, Data surmises the disturbances may be caused by pockets of dark matter in the nebula. Realizing the ship is in grave danger, Captain Picard (Patrick Stewart) boards a shuttle and attempts to guide the starship to safety. But like Data's relationship, traversing the nebula proves to be a challenging and dangerous experience! 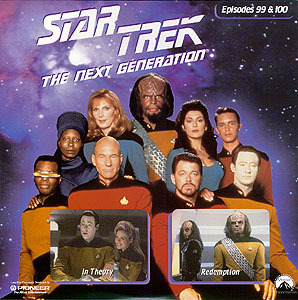 Captain Picard (Patrick Stewart) is invited to attend the installation of Gowron (Robert O'Reilly) as the new leader of the Klingon High Council. En route, he learns that the Duras family is plotting a civil war, but Picard insists that the Federation cannot become involved. Upon arriving at the Klingon home world, Worf (Michael Dorn) requests a leave of absence to visit his brother, the captain of a Klingon warship. Together, they devise a plan to back Gowron and finally clear their family name. But with the secret support of the Romulans, the Duras family appears invincible. When the rebels attack Gowron's ship, Worf is able to defeat the onslaught and help Gowron assume rightful control of the High Council. With his family's honor restored. Worf's loyalties are torn between the Federation and his own people.